During the heat of summer in Southern California, hosting or attending an outdoor event can be very daunting. A simple solution can make the attendees feel much better and stick around for a longer period of time. Inflatable tents that have a misting option are the answer! Ultimate Jumpers, Inc. has inflatable tents for sale that can be customized. These inflatable tents for sale can be set up just about anywhere, for personal or business use. Our Inflatable Tent with Optional Misting System is perfect for outdoor events where guests need to be made comfortable. In addition, you want to make sure your guests, the food and anything else important stays underneath the shade. This inflatable tent also has an option to add a misting system so the water mist will cool off your guests during those hot days. Simply attach a hose to the mister hose and you’ll have a nice breeze of cool air surrounding under and around the tent. One of the other inflatable tents for sale is the Inflatable 20′ Tent. This tent is perfect for parties, carnivals, fundraisers, and company picnics. In fact, colors of the tent can be changed at no extra charge to better fit specific events. Provide some cooling shade for your party or guests and ensure comfort throughout the day. In addition, you can discuss your advertising banner needs with a sales associate. 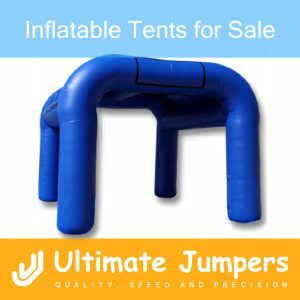 Requests were pouring in over the years with customers demanding inflatable tents to be manufactured by Ultimate Jumpers. Safety, durability as well as measurement factors all need to be taken into account in order to make a successful product. At Ultimate Jumpers, Inc., we pride ourselves in incredibly durable products that are safe, dependable, and long lasting. Our excellent customer service is just the icing on the cake.